Chapter 6: Freezing For a Fight (A) : Beauregard’s plans. P. 144 – On July 4, while scouting the no-man’s land between the Confederate and Union positions in NoVa, two members of the Black Horse Cavalry were killed by friendly fire. P. 145 – Bory complained to anyone and everyone of the problems he was facing. He was in constant fear of attack, and called continuously for reinforcements. While most expectant of an attack on the road from Centreville to Manassas at Mitchell’s Ford, he also considered the likelihood of a flanking maneuver on his left, in the Stone Bridge area. The author points out the incongruity of Bory’s fear and the fact that he assigned only a small contingent at Stone Bridge, under “a known inebriate,” Shanks Evans. P. 146-147 – Giving counsel to his fears, Bory informed Richmond “I shall act with extreme caution.” He laid out his “defensive strategy” in S.O. 100 on July 8. This firmed up the positions of the three brigades south of Bull Run, and also instructed those three brigades north of the Run, in the event of an attack, to fall back to various points along it before being overwhelmed – that is, don’t put up a fight. But on July 10, Bory received intelligence of McDowell’s impending advance via spy Bettie Duval that changed his perspective, and on July 13 he again pitched his unification scheme to both Richmond and Joe Johnston. This new scheme became quite grandiose. Johnston never replied, and Richmond again rejected Bory. I don’t really have a problem with any of this. But then, Bory’s plans aren’t really my bag and I’ve got no reason to part with traditional interpretations. Next up, though, are the Federal commander’s plans. Plural. Let’s always keep that in mind. I was standing with a friend and classmate at the moment on a high ridge near our advancing line. We were congratulating ourselves upon the glorious victory which already seemed to have been ours, as the Confederates were everywhere giving way, when our attention was attracted by a long line of troops suddenly appearing behind us upon the edge of the timber already mentioned. It never occurred to either of us that the troops we then saw could be any but some of our reinforcements making their way to the front. Before doubts could arise we saw the Confederate flag floating over a portion of the line just emerging from the timber; the next moment the entire line leveled their muskets and poured a volley into the back s of our advancing regiments on the right. At the same time a battery which had also arrived unseen opened fire, and with the cry of “We’re flanked! We’re flanked!” passed from rank to rank, the Union lines, but a moment before so successful and triumphant, threw down their arms, were seized by a panic, and begun a most disordered panic. All this occurred almost in an instant of time. No pen or description can give anything like a correct idea of the rout and demoralization that followed. Officers and men joined in one vast crowd, abandoning, except in isolated instances, all attempts to preserve their organizations. 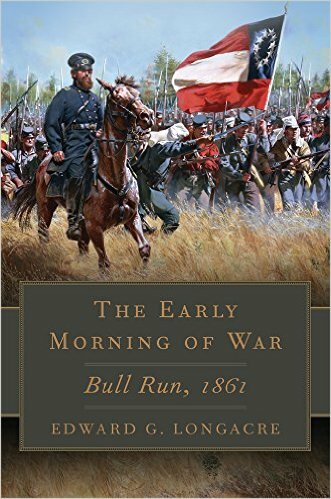 A moderate force of good cavalry at that moment could have secured to the Confederates nearly every man and gun that crossed Bull Run in the early morning. Fortunately the Confederate army was so badly demoralized by their earlier reverses, that it was in no mood or condition to make pursuit, and reap the fill fruits of victory. The troops that had arrived on the battlefield so unexpectedly for the Federals, and which had wrought such a disaster on the Union arms, were Elzey’s brigade of infantry and Beckham’s battery of artillery, the whole under command of Brigadier General Kirby Smith, being a detachment belonging to Johnston’s Army of the Shenandoah, just arrived from the valley. Had this command reached the battlefield a few minutes later, the rout of Beauregard’s army would have been assured, as his forces seemed powerless to check the advance of the Union troops. General McDowell and his staff, as did many of the higher officers, exerted themselves to the utmost to stay the retreating Federals, but all appeals to the courage and patriotism of the latter fell as upon dumb animals. One who has never witnessed the conduct of large numbers of men when seized by a panic such as that was cannot realize how utterly senseless and without apparent reason men will act. And yet the same men may have exhibited great gallantry and intelligence but a moment before. The value of discipline was clearly shown in the crisis by observing the manner of the few regular troops, as contrasted with the raw and undisciplined three months’ men. The regular soldiers never for a moment ceased to look to their officers for orders and instructions, and in retiring from the field, even amid the greatest disorder and confusion of the organizations near them, they preserved their formation, and marched only as they were directed to do. The long lines of Union soldiery, which a few minutes before had been bravely confronting and driving the enemy, suddenly lost their cohesion and became one immense mass of fleeing, frightened creatures. Artillery horses were cut from their traces, and it was no unusual sight so see three men, perhaps belonging to different regiments, riding the same horse, and making their way to the rear as fast as the dense mass of men moving with them would permit. The direction of the retreat was toward Centreville, by way of the Stone Bridge crossing, and other fords above that point. An occasional shot from the enemy’s artillery, or the cry that the Black Horse cavalry, so dreaded in the first months of the war in Virginia, were coming, kept the fleeing crowd of soldiers at their best speed. Arms were thrown away as being no longer of service in warding off the enemy. Here and there the state colors of a regiment, or perhaps the national standard, would be seen lying on the ground along the line of retreat, no one venturing to reclaim or preserve them, while more than on full set of band instruments could be observed, dropped under the shade of some tree in rear of the line of battle, and where their late owners had probably been resting from the fatigues of the fight when the panic seized them and forced them to join their comrades in flight. One good regiment composed of such sterling material as made up the regiments of either side at the termination of the war could have checked the pursuit before reaching Bull Run, and could have saved much of the artillery and many of the prisoners that as it was fell into the enemy’s hands simply for want of owners. The rout continued until Centreville was reached; then the reserves posted under Miles gave some little confidence to the retreating masses, and after the latter had passed the reserves, comparative order began in a slight degree to be restored. General McDowell at first decided to halt and make a stand on the heights near Centreville, but this was soon to be discovered to be inadvisable, if not impracticable, so large a portion of the army having continued in their flight toward Washington. Orders were then given the various commanders to conduct their forces back to their former camps near Arlington opposite Washington, where they arrived the following day. The cavalry, on the Federal side consisting of only seven companies of regulars under Major Palmer, were not employed to any considerable extent during the battle except as supports to batteries of artillery. One charge was made in the early part of the battle near the Warrenton Turnpike by Colburn’s squadron. In advancing in the attack in the morning, Palmer’s companies accompanied Hunter’s division in the long and tedious movement through an immense forest by which Bull Run was crossed at one of the upper fords, and the left flank of the Confederates successfully turned. After arriving at Sudley Springs, the cavalry halted for half an hour or more. We could hear the battle raging a short distance in our front. Soon a staff officer of General McDowell’s came galloping down to where the cavalry was waiting, saying that the general desired us to move across the stream and up the ridge beyond, where we were to support a battery. The order was promptly obeyed, and as we ascended the crest I saw Griffin with his battery galloping into position. The enemy had discovered him, and their artillery had opened fire upon him, but the shots were aimed so high that the balls passed overhead. Following the battery, we also marched within plain hearing of each shot as it passed over Griffin’s men. I remember well the strange hissing and exceedingly vicious sound of the first cannon shot I heard as it whirled through the air. Of course I had often heard the sound made by cannon balls while passing through the air during my artillery practice at West Point, but a man listens with changed interest when the direction of the balls is toward instead of away from him. They seemed to utter a different language when fired in angry battle from that put forth in the tamer practice of drill. The battery whose support we were having reached its position on an advanced crest near the right of the line, the cavalry massed near the foot of the crest and sheltered by it from the enemy’s fire. Once the report came that the enemy was moving to the attack of the battery which we were specially sent to guard, the order was at once given for the cavalry to advance from the base to the crest of the hill and repel the enemy’s assault. We were formed in column of companies, and were given to understand that upon reaching the crest of the hill we would probably be ordered to charge the enemy. When it is remembered that but three days before I had quitted West Point as a schoolboy, and as yet had never ridden at anything more dangerous or terrible than a three-foot hurdle, or tried my sabre upon anything more combative than a leather head stuffed with tan bark, it may be imagined that my mind was more or less given to anxious thoughts as we ascended the slope of the hill in front of us. At the same time I realized that I was in front of a company of old and experienced soldiers, all of whom would have an eye upon their new lieutenant to see how he comported himself when under fire. My pride received an additional incentive from the fact that while I was on duty with troops for the first time in my life, and was the junior officer of all present with the cavalry, there was temporarily assigned to duty with the company another officer of the same rank, who was senior to me by a few days, and having been appointed from civil life, was totally without military experience except such as he had acquired during the past few days. My brief acquaintance with him showed me that he was disposed to attach no little importance to the fact that I was fresh from West Point and supposed to know all that was valuable or worth knowing in regard to the art of war. In this common delusion I was not disposed to disturb him. I soon found that he was inclined to defer to me in opinion, and I recall now, as I have often done when in his company during later years in the war, the difficulty we had in deciding what weapon we would use in the charge to which we believed ourselves advancing. As we rode forward from the foot of the hill, he in front of his platoon and I abreast of him, in front of mine, Walker (afterward captain) inquired in the most solemn tones, “Custer, what weapon are you going to use in the charge?” From my earliest notions of the true cavalryman I had always pictured him in the charge bearing aloft his curved sabre, and cleaving the skulls of all with whom he came in contact. We had but two weapons to choose from: each of us carried a sabre and one revolver in our belt. I promptly replied, “The Sabre”, and suiting the action to the word, I flashed my bright new blade from its scabbard, and rode forward as if totally unconcerned. Walker, yielding no doubt to what he believed was “the way we do it at West Point,” imitated my motion, and forth came his sabre. I may have seemed to him unconcerned, because I aimed at this, but I was far from enjoying that feeling. As we rode at a deliberate walk up the hill, I began arguing in my own mind as to the comparative merits of the sabre and revolver as a weapon of attack. If I remember correctly, I reasoned pro and con about as follows: “Now, the sabre is a beautiful weapon; it produces an ugly wound; the term ‘sabre charge’ sounds well; and above all the sabre is sure; it never misses fire. It has this drawback, however: in order to be made effective it is indispensable that you approach very close to your adversary – so close that if you do not unhorse or disable him, he will most likely render that service to you. So much for the sabre. The result was that I returned my sabre to its scabbard, and without uttering a word drew my revolver and poised it opposite my shoulder. Walker, as if following me in my mental discussion, no sooner observed my change of weapon than he did likewise. With my revolver in my hand I put it upon trial mentally. First, I realized that in the rush and excitement of the charge it would be difficult to take anything like accurate aim. Then, might not every shot be fired, and without result…? In all probability we would be in the midst of our enemies, and slashing right and left at each other, in which case a sabre would be of much greater value and service than an empty revolver. This seemed convincing; so much so that my revolver found its way again to its holster, and the sabre was again at my shoulder. Again did Walker, as if in pantomime, follow my example. How often these changes of purpose and weapons might have been made I know not – had the cavalry not reached the crest meanwhile and, after being exposed to a hot artillery fire and finding that no direct attack upon our battery was meditated by the enemy, returned to a sheltered piece of ground. A little incident occurred as we were about to move forward to the expected charge, which is perhaps worth recording. Next to the company with which I was serving was one which I noticed as being in most excellent order and equipment. The officer in charge of it was of striking appearance, tall, well-formed, and handsome, and possessing withal a most soldierly air. I did not then know his name, but being so near to him and to his command, I could not but observe him. When the order came for us to move forward up the hill, and to be prepared to charge the moment the crest was reached. I saw the officer referred to ride gallantly in front of his command, and just as the signal forward was given, I heard him say, “Now men, do your duty.” I was attracted by his soldierly words and bearing, and yet within a few days after the battle he tendered his resignation, and in a short time was serving under the Confederate flag as a general officer. When the retreat began, my company and one other of cavalry, and a section of artillery, command by Captain Arnold, came under the personal direction and control of Colonel Heintzelman, with whome we moved toward Centreville. Colonel Heintzelman, although suffering from a painful wound, continued to exercise command, and maintained his seat in the saddle. The two companies of cavalry and the section of Arnold’s battery moved off the field in good order, and were the last organized Union troops to retire across Bull Run. Within about two miles of Centreville, at the bridge across Cub Run, the crossing was found to be completely blocked up by broken wagons and ambulances. There being no other crossing available, and the enemy having opened with artillery from a position a short distance below the bridge, and commanding the latter, Captain Arnold was forced to abandon his guns. The cavalry found a passable ford for their purpose, and from this point no further molestation was encountered from the enemy After halting a few hours in some old camps near Centreville, it now being dark, the march was resumed, and kept up until Arlington was reached, during the forenoon of the 22d. The press and people of the South accepted the result of the battle as forecasting if not already assuring the ultimate success of their cause, and marking, as they expressed it, the birth of a nation, and while this temporary advantage may have excited and increased their faith as well as their numbers, by drawing or driving into their ranks the lukewarm and those inclined to remain loyal, yet it was a source of weakness as well, from the fact that the people of the South were in a measure confirmed in the very prevalent belief which had long existed in the Southern states regarding the great superiority in battle of the Southron over his fellow countryman in colder climes. This impression maintained its hold upon the minds of the people of the South and upon the Southern soldiery until eradicated by months and years of determined battle. The loyal North accepted its defeat in the most commendable manner, and this remark is true whether applied to the officials of the states and general government or to the people at large. There was no indulging in vain or idle regrets; there was no flinching from the support and defense of the Union; there was least of all hesitation as to the proper course to pursue. If the idea of compromise had been vainly cherished by any portion of the people, it had vanished, and but one sentiment, one purpose actuated the men of the North, as if acting under a single will. Men were hurried forward from all the loyal states; more offered their services than the government was prepared to accept. The defeat of the Union arms forced the North to coolly calculate the immense task before it in attempting to overthrow the military strength of the insurgent states. Had Bull Run resulted otherwise than it did, had the North instead of the South been the victor, there would have been danger of a feeling of false security pervading the minds of the people of the North. Their patriotism would not have been awakened by success as it was by disaster; they would not have felt called upon to abandon the farm, the workshop, the counting room, and the pulpit in order to save a government tottering almost upon the brink of destruction. Before passing from the consideration of the Battle of Bull Run, the plan of the battle is entitled to a few words. No subsequent battle of the war, no matter how successful or important in result, was more carefully or prudently planned; and so far as left to the accomplishment of what he had proposed to da and what he had expressly stipulated he would do – the overthrow of Beauregard’s army – McDowell did all and more than had been expected of him. He had asked that the Confederate forces in the Valley under Johnston should be prevented from reinforcing Beauregard, but this was not done. Johnston united most of his force with that of Beauregard before the battle began; and even over these combined armies McDowell’s plan of battle, after hours of severe struggle, was carried to successful execution and only failed in attaining final triumph by the arrival at a critical moment of fresh troops from the Valley. In the preceding chapter I described my night ride from Washington to the camp of McDowell’s army at and about Centreville. After delivering my dispatches and concluding my business at headquarters, I remounted my horse, and having been directed in the darkness the way to the ground occupied by Palmer’s seven companies of cavalry, I set out to find my company for the first time, and report to the commanding officer for duty before the column should begin the march to the battleground. As previously informed by a staff officer at headquarters, I found it necessary only to ride a few hundred yards, when suddenly I came upon a column of cavalry already mounted and in readiness to move. It was still so dark that I could see but a few lengths of my horse in any direction. I accosted one of the troopers nearest me., and inquired, “What cavalry is this?” “Major Palmer’s,” was the brief reply. I followed up my interrogations by asking, “Can you tell me where Company G, Second Cavalry, is?” the company to which I had been assigned, but as yet had not seen. “At the head of the column,” came in response. Making my way along the column in the darkness, I soon reached the head, where I found several horsemen seated upon their horses, but not formed regularly in column. There was not sufficient light to distinguish emblems of rank, or to recognize the officer from the private soldier. With some hesitation I addressed the group, numbering perhaps a half dozen or so individuals, and asked if the commanding officer of my company, giving the designation by letter and regiment, was present. “Here his is,” promptly answered a voice, as one of the mounted figures rode toward me, expecting no doubt I was a staff officer bearing orders requiring his attention. I introduced myself by saying, “I am Lieutenant Custer, and in accordance with orders from the War Department, I report for duty with my company, sir.” “Ah, glad to meet you Mr. Custer. We have been expecting you, as we saw in the list of assignments of the graduating class from West Point, that you had been marked down to us. I am Lieutenant Drummond. Allow me to introduce you to some of your brother officers.” Then, turning his horse toward the group of officers, he added, “Gentlemen, permit me to introduce you to Lieutenant Custer, who has just reported for duty with his company.” We bowed to each other, although we could see but little more than the dim outlines of horses and riders as we chatted and awaited the order to move “forward.” This was my introduction to service, and my first greeting from officers and comrades with whom the future fortunes of war was to cast me. Lieutenant Drummond, afterward captain, to whom I had just made myself known, fell mortally wounded at the Battle of Five Forks, nearly four years afterward. While it is not proposed to discuss in detail the movements of troops during the Battle of Bull Run or Manassas, a general reference to the positions held by each of the contending armies the night preceding combat may be of material aid to the reader. Beauregard’s headquarters were at or near Manassas, distant from Centreville, where General McDowell was located in the midst of his army, about seven miles. The stream which gave its name to the battle runs in a southwest direction between Centreville and Manassas, somewhat nearer to the former place than to the latter. The Confederate army was posted in position along the right bank of Bull Run, their right resting near Union Mill, the point at which the Orange and Alexandria Railroad crosses the stream, their center at Blackburn’s Ford, while their left was opposite the Stone Bridge, or crossing of the Warrenton Pike, at the same time holding a small ford about one mile above the Stone Bridge. Beauregard’s entire force that day numbered a few hundred over 23,000 with 55 pieces of artillery, notwithstanding that the president of the Confederacy, who arrived on the battlefield just before the termination of the battle, telegraphed to Richmond, “Our force was 15,000.” Ewell commanded on the Confederate right; Longstreet in the center, at Blackburn’s Ford; and Evans the left, at and above the Stone Bridge. The Federal forces were encamped mainly opposite the left center of their adversary’s line. The numbers of the two contending armies were very nearly equal, the advantage, if any, in this respect, resting with the Union troops; neither exceeded the force of the other beyond a few hundred. General McDowell crossed Bull Run, in making his attack on the enemy that day, with only 18,000 men and 22 guns. But to this number of men and guns must be added nearly an equal number left on the east side of Bull Run for the double purpose of constituting a reserve and occupying the enemy’s attention. All of these troops were more or less under fire during the progress of the battle. Thus it will be seen that the number of men was about equal in both armies, while the Confederates had six pieces of artillery in excess of the number employed by their adversaries. Reconnaissances and a skirmish with the enemy on the 18th had satisfied General McDowell that an attack on the enemy’s center or left did not promise satisfactory results. He decided, therefore, to make a feigned attack on the enemy’s center at Blackburn’s Ford, and at the same time to cross Bull Run at a point above that held by the enemy, and double his adversaries left flank back upon the center and right, and at the same time endeavor to extend his own force beyond Bull Run sufficiently far to get possession of and destroy the Manassas Gap Railroad, thus severing communications between Beauregard’s army and its supports in the valley beyond. McDowell’s forces, those engaged in the battle…divided into four divisions, commanded by Brigadier General Daniel Tyler, Connecticut volunteers; Colonels David Hunter, S. P, Heintzelman, and D. S. Miles. Tyler’s division was to occupy the attention of the enemy by threatening movements in front of the Stone Bridge, while the divisions of Hunter and Heintzelman were to move up Bull Run, keeping beyond the observation of the enemy, cross that stream, and turn the enemy’s left flank. Miles’s division was to constitute the reserve of the Federal army, and to occupy ground near Centreville. Richardson’s brigade of Tyler’s division was to act in concert with the latter, under Miles, and to threaten with artillery alone the enemy stationed at Blackburn’s Ford. Still another division, Runyon’s, formed a part of McDowell’s forces, but was not made available at the battle of the 21st, being occupied in guarding the communication of the army as far as Vienna, and the Orange and Alexandria Railroad; the nearest regiment being seven miles in rear of Centreville. It will thus be seen that as McDowell only crossed 18.000 men over Bull Run to attack about 32,000 of the enemy, his reserve, not embracing Runyon’s division, was but little less in number than his attacking force. One of the conditions under which General McDowell consented to the movement against the enemy at Manassas was that the Confederate forces in the Shenandoah Valley, under Johnston, who were then being confronted, and supposed to be held in check by the Federal army, under Major General Patterson of the Pennsylvania volunteers, should not be permitted to unite with the forces of Beauregard. This was expecting more than could be performed, unless Patterson had been ordered to attack simultaneously with the movement of McDowell. As it was, Beauregard no sooner learned of McDowell’s advance on the 17th of July than Johnston was ordered by the Confederate authorities at Richmond to form an immediate junction at Manassas with Beauregard. Other troops, under Holmes, consisting of infantry, cavalry, and artillery, amounting to about one brigade, were also ordered to join Beauregard. The promised arrival of these heavy reinforcements induced Beauregard to depart from his resolution to act upon the defensive. He determined to attack General McDowell at Centreville as soon as he should be assured of the near arrival of Johnston’s and Holmes’s commands. His first plan was to have a portion of Johnston’s army march from the valley by way of Aldie, and attack McDowell in rear and upon his right flank, while his own army should make an attack directly in front. This plan was abandoned, and instead it was agreed between Beauregard and Johnston that the forces of both should be united west of Bull Run, and matched to the direct attack of the Federals. In pursuance of this plan Johnston arrived at Manassas at noon on the 20th, the day preceding the battle, and being senior to Beauregard in rank, he nominally assumed command of both Confederate armies, but assented to Beauregard’s plans, and virtually conceded their execution to that general. It is somewhat remarkable that the Federal and Confederate commanders had each determined to attack the other on the same day, the 21st. The Confederate general was induced to alter his plan, and act upon the defensive, but a few hours before his lines were assailed by McDowell; his decision in this matter being influenced by two circumstances. One was the detention of about 8,000 of Johnston’s men, whose presence had been relied upon; the other was the discovery several hours before daylight that the Federal army was itself advancing to the attack. Beauregard had ordered his forces under arms and was awaiting his adversary’s attack at half-past four o’clock the morning of the 21st. Reasoning correctly that McDowell was not likely to attack his center at Blackburn’s Ford, not to operate heavily against his right near Union Mills, Beauregard no sooner discovered the movement of Hunter’s and Heintzelman’s divisions, to pass above and around his left flank at Sudley Springs, than he began moving up his reserves and forming his left wing in readiness to receive the attacking division as soon as the latter should cross Bull Run. Hunter and Heintzelman were forced to make a much longer detour, in order to make the designated crossings of Bull Run, than had been anticipated. The first gun announcing the commencement of the battle was fired from Tyler’s division in front of the Stone Bridge. It was not until nearly 10:00 A. M. that the troops of Hunter’s division came in contact with the enemy near Sudley Springs. Once over the stream, both Hunter and Heintzelman promptly engaged the enemy, and slowly forced his entire left wing back until the troops under Tyler were able to cross and participate in the battle. Beauregard, soon after satisfying himself of the real character and direction of his adversary’s movement, decided upon a counter-attack by throwing his right wing and center across Bull Run at Blackburn’s and Union Mills fords, and endeavoring to do with his enemy exactly what the latter was attempting with him – to turn his right flank. By this movement he hoped to place a large force in rear of Centreville and ensure McDowell’s defeat. The orders for this movement, which were sent to Ewell on the right, miscarried, and too much time was lost before the mistake could be rectified. It was fortunate for the Confederates that this was the case, as had this turning movement been attempted, the troops sent to the Federal side of Bull Run to execute it would in all probability have been held in check by the heavy Federal reserves under Richardson and Miles, and would have been beyond recall when, later in the day, Beauregard, finding his left giving way in confusion before the successful advance of Hunter’s, Heintzelman’s, and Tyler’s divisions, rapidly moved every available man from his right to the support of his broken left. Had Beauregard attempted to turn the position at Centreville, McDowell would have achieved a complete victory over all the Confederate forces opposed to him on the Confederate side of Bull Run several hours before the arrival upon the battlefield of the Confederate troops from the valley whose coming at a critical time decided the battle in the Confederates’ favor. With the exception of a little tardiness in execution, something to be expected perhaps in raw troops, the plan of battle marked out by General McDowell was carried out with remarkable precision up till about 3:30 P.M. The Confederate left wing had been gradually forced back from Bull Run until the Federals gained entire possession of the Warrenton Turnpike leading from the Stone Bridge. It is known now that Beauregard’s army had become broken and routed, and that both himself and General Johnston felt called upon to place themselves at the head of their defeated commands, including their last reserves, in their effort to restore confidence and order; General Johnston at one critical moment charged to the front with the colors of the Fourth Alabama. Had the fate of the battle been left to the decision of those who were present and fought up till half-past three in the afternoon, the Union troops would have been entitled to score a victory with scarcely a serious reverse. But at this critical moment, with their enemies in front giving way in disorder and flight, a new and to the Federals unexpected force appeared suddenly upon the scene. From a piece of timber directly in rear of McDowell’s right a column of several thousand fresh troops of the enemy burst almost upon the backs of the half-victorious Federals. P. 121 – Early on, Col. Ambrose Burnside’s 1st Rhode Island Infantry was part of George Thomas’s brigade of Patterson’s command. This of course would change and Burnside and the 1st RI would have a prominent role at Bull Run. P. 124 – After taking Harper’s Ferry in mid-June “without firing a shot,” Patterson determined that Johnston’s retreat was so rapid he could not overtake him before Winchester. P. 124-125 – Part and parcel to the mixed signals Patterson was receiving from Winfield Scott all during his foray into the Valley, after taking Harper’s Ferry, seeing no need for Patterson to press Johnston, Scott ordered the U. S. Regulars and the 1st RI returned to Washington. This left Patterson “with an army composed almost entirely of three-months’ volunteers, half of whose service terms had already expired or were about to.” The author theorizes that part of Scott’s reasoning was “a belated realization that the present campaign would be won or lost in McDowell’s theater. Scott had finally come to see Patterson’s operations as supportive of McDowell’s.” Would he ever communicate this realization to Patterson? P. 130 – On June 20, on Johnston’s ordered the not-as-yet “Stonewall” Jackson destroyed B&O train cars and tracks at Martinsburg, to deny the resources to the enemy. Johnston ordered this as he understood it in conformance with directives from Richmond. However, the reaction from those quarters was far from laudatory. Maryland politicians and citizens, and especially B&O shareholders, were livid. Johnston’s stock in the Confederacy was now losing value as well. PP. 135-137 – Also on the 20th, Scott ordered Patterson to submit a plan for moving his army east to support Col. Charles P. Stone’s brigade’s move on Confederate outposts between Leesburg and Washington. Patterson submitted plans for just such a move, which he later argued would have changed events considerably in favor of the Union.But on the 25th, Scott changed his mind and told Patterson to stay at Harper’s Ferry. Scott continued to mix signals [IMO (in my opinion)] by cautioning Patterson to engage Johnston only “if you are in superior or equal force,” but that it “would not due to pursue them as far as Winchester.” In light of later events and Scott’s assertions to the contrary, the General-in-Chief’s directives to Patterson were as clear as mud [again, IMO]. The footnote for this paragraph cites Starr’s Bohemian Brigade and Warner’s Generals in Blue. Neither of these are primary sources (nothing wrong with that), and neither of them discuss the origin of the name Army of Northeastern Virginia (this is the first time the name is used in this book.) Why does this note not cite some order creating the army, or some report referring to it for the fist time? Because, as far as I’ve been able to determine, there never was any organization on the books called The Army of Northeastern Virginia. The moniker was only applied post-battle, and post formation of The (Federal) Army of the Potomac. Why is this important? What difference does it make? Maybe none. But it bugs the heck out of me when I see it. OK, enough on that, let’s move on. Pp. 93-94 – The author notes that McDowell was hampered not only by “inadequate communications” south of the Potomac, but also faced a shortage of wagons to carry rations for his army when on the march. He had to deal with a “lack of cooperation from superiors and colleagues alike,” and that McDowell would later attribute this to Winfield Scott’s dissatisfaction with his elevation to command of the army in the field. General J. K. F. Mansfield was an instrument in Scott’s obstruction of McDowell’s efforts. P. 101 – In the same vein, McDowell later claimed that he “had no opportunity to test my machinery…” That is, he couldn’t drill his new regiments in battlefield, brigade sized evolutions. When he did exercise a group of eight regiments together, Scott accused him of “trying to make some show.” The author points out that failure to drill regiments as brigades and divisions resulted in the inability to use them as such in practice. This gives some insight into the time-honored opinion that the “piece-meal” insertion of units into the battle was key to Union defeat. I see the actions in the Shenandoah Valley at this time as much less important to the story of First Bull Run than does pretty much everyone else, primarily because it figured so little in Federal planning, and even in the failure of that planning (more on that later, but I’ve written about it often). Needless to say, Mr. Longacre is not of the same opinion, and provides substantial coverage of that area of operations. I didn’t skip over this when reading the book, so I won’t skip over it here. P. 45 – I was unaware that Joseph Johnston resigned from the army in 1837, to take a civilian position with the Topographical Bureau in Washington. This is similar to a tact taken by George Meade, who, like Johnston, was assigned to the artillery upon graduation from West Point and who, like Johnston, felt he was stagnating there, and who, like Johnston, moved to a civilian position in the Topographical Bureau, and who, like Johnston, used this as a backdoor later to return to the army in the more prestigious Topographical Engineers. I did not know that about Johnston (Longacre does not make the Meade connection, which is neither here nor there). P. 61 – On this page, Longacre becomes the first author other than Russel Beatie to emphasize, in foreshadow, the influence that the character of Fitz John Porter may have had on his superior officer in the Shenandoah Valley, Robert Patterson. P. 62 – The plan of how to move recruits to secure Washington in May of 1861 was devised by Patterson. P. 71 – A nice description of the geography around Bull Run, noting the convergence of major roads at Centreville, the Centreville Ridge, the thin population and poor soil. P. 73 – The author points out the significance of the railroad junction at Manassas to both armies, and discussed the concerns of Robert E. Lee, who as Virginia’s head military honcho played a major role in the development of defenses in the area. Pp. 74-75 – A nice description of the less than attractive personality of Beauregard’s predecessor in command Milledge Luke Bonham. At the end of the campaign, every member of his staff transferred elsewhere. P. 79 – The author points out several times the importance of interior lines in the planning and disposition of Confederate forces, in the thinking of folks like Lee and Beauregard. The biographical sketch of McDowell is pretty good here, more in-depth than you’ll find pretty much anywhere else. It touches on McDowell’s familial political connections, his broad education, experiences as a staff officer, alcohol abstention, and generally favorable impression upon military and political figures. This all contributes to making his ultimate appointment to command of an army more understandable and less serendipitous. I would have preferred a little more on McDowell’s actual rank (while a brevetted major, his actual rank prior to appointment as a full Brigadier General U. S. A. was as First Lieutenant) affected his relationship with other officers and his boss, Winfield Scott. This chapter (p. 29) also gives the first glimpses into McDowell’s planning process, primarily with very preliminary plans he presented to his benefactor, Treasury Secretary Salmon Chase, in May, 1861. These plans far exceeded McDowell’s areas of influence, and I think should not be given too much weight in examining the plans he would later develop, under changed circumstances, for moving on Manassas. It seems to me some of the assumptions and conditions in these earlier, larger plans get conflated by analysts into McDowell’s later, more narrow plans. The background provided on Beauregard in this chapter is pretty standard, with a little more discussion of his pre-war politics than one normally finds in general sketches. One surprise here is a description of Beauregard’s character (p. 22) provided by South Carolina Governor Pickens in a 7/7/1861 letter to fellow South Carolinian Milledge Luke Bonahm, whom Bory had succeeded in command of the Bull Run line. In that letter, which may have been written in part as salve for the wounded pride of the recipient, Beauregard is described in terms usually applied to his comrade Joe Johnston (“His reputation is so high that he fears to risk it”). Also in this chapter is a brief recap of General Scott’s “offering” of “command” of “the” Union army to Robert E. Lee which left me as dissatisfied as most accounts of the meeting. Check back here often for the next installment. I’m going to make an effort to put up a couple chapters per month from here on out.